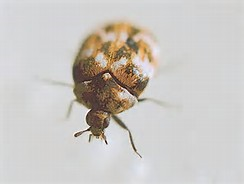 There are several species of Carpet Beetle, the most common being the black Fur Beetle which is around 4.5 - 6mm in length, oblong shaped and has a single white spot on each wing case. 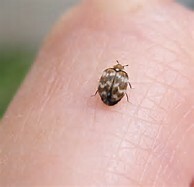 The Varied Carpet Beetle is a small round beetle of abut 2-3mm in length. Colouration can be dark brown or black with mottled patches of white or yellow and resembles a small mottled ladybird. 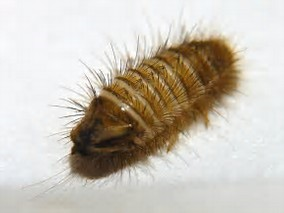 The larvae of carpet beetles are fairly distinctive and known as "woolly bears". They are usually light brown in colour and covered in dense hairs, hence the name, woolly bears. Adult carpet beetles are active during the day, feed on pollen and live outdoors. During spring and early summer they search out a suitable site to lay their eggs. Each female will lay between 20-100 eggs on furs, wool, natural fibres and between cracks and crevices. Within four weeks the eggs hatch and the woolly bears emerge and embark on a continuous feeding binge. 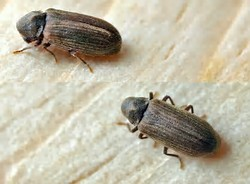 Adult carpet beetles may be seen flying towards lights or crawling on surfaces. Adults will sometimes be found in groups on window sills as they are attracted to the daylight. 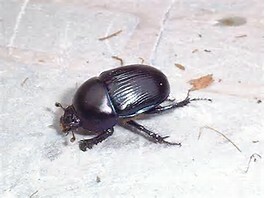 The most likely sign that beetles are present is the damage caused by the larvae. Damage to carpets, clothing and even textiles products with a small percentage of natural fibres can be damaged. Carpet beetle infestations tend to go unnoticed for long periods of time, allowing them to cause severe damage to clothes, carpets, furniture and bedding. Why do I have a Carpet Beetle infestation? Dry pet foods can attract carpet beetles and it is important to check these food sources regularly to prevent infestation. Old and unoccupied bird nests should be removed from eaves and loft spaces. Dead birds or rodents found in chimneys, under floors or in loft spaces should also be removed, not only for hygienic purposes but they are also known to attract carpet beetles. How serious is a Carpet Beetle infestation? 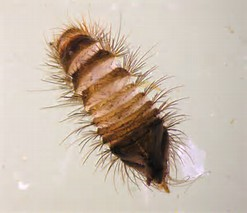 Carpet Beetles do not carry disease and do not bite so are therefore not considered a risk to human health. It has been known for the hairs on the larvae (woolly bears) to cause skin irritations for some people, although this is very unusual. However, carpet beetles are a nuisance pest due to the damage that they can cause. Due to infestations being fairly difficult to spot the damage that they can cause can be extreme. Can I treat a Carpet Beetle infestation myself? Due to the difficulty in identifying an infestation and the knowledge required regarding preferred habitat location, it is recommended that a professional pest control company is contacted. 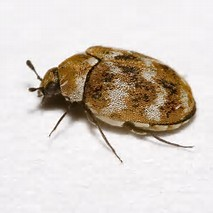 Here at Bradford Pest Control, our technicians are fully knowledgeable and trained in carpet beetle treatment. With access to the best professional use tools and products you can be rest assured that our service will be carried out quickly and safely. 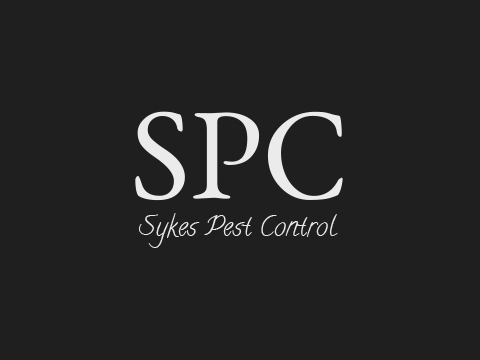 Upon making contact with our professional pest control team, an appointment will be made at your convenience to visit your home or business premises. 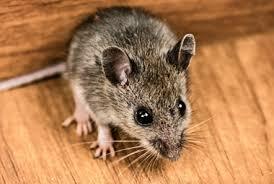 Our professional pest control technician will examine your property and identify the problem. On completion of the inspection and an assessment of the situation, the technician will recommend the best cause of action to get treat the carpet beetle infestation. Our technician will use the best tools and professional use products to treat the problem. All we ask if for you to ensure that all floor covering has been vacuumed thoroughly and rooms at risk of infestation are free of clutter. After the treatment has been completed we will ask you to refrain from vacuuming for at least 10 days. Please note: If these steps are not followed you risk further carpet beetle infestation to your property.